CC Madhya 24.346: Thus I have narrated Lord Caitanya’s mercy upon Sanātana Gosvāmī. When one hears these topics, one’s heart will be cleansed of all contamination. CC Madhya 24.351: I have thus explained the mercy bestowed on Sanātana Gosvāmī by Śrī Caitanya Mahāprabhu. If one hears this description, all moroseness in the heart will diminish. CC Madhya 24.352: By reading these instructions to Sanātana Gosvāmī, one will become fully aware of Lord Kṛṣṇa’s various expansions and the process of devotional service according to the regulative principles and spontaneous love. Thus everything can be fully known. CC Madhya 24.353: By reading these instructions, a pure devotee can understand love of Kṛṣṇa, the mellows of devotional service and the conclusion of devotional service. Everyone can understand all these things to their ultimate end by studying these instructions. CC Madhya 24.354: The conclusion of these instructions can be known to one whose life and soul are the lotus feet of Śrī Caitanya Mahāprabhu, Nityānanda Prabhu and Advaita Prabhu. CC Madhya 23.122: “If You want to make a lame man like me dance, kindly bestow Your transcendental blessings by placing Your lotus feet on my head. 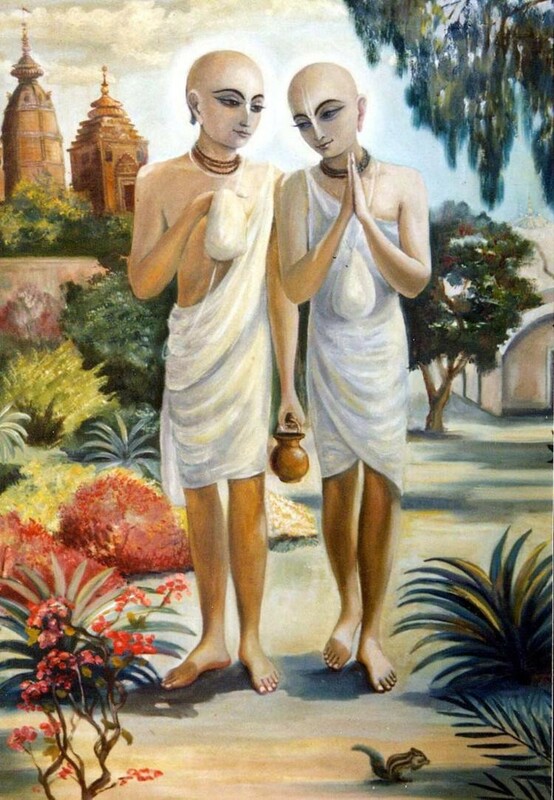 CC Madhya 25.3: Lord Caitanya Mahāprabhu instructed Śrī Sanātana Gosvāmī in all the conclusions of devotional service for two consecutive months. Lord Caitanya made Sanatana Goswami the Sambhandha Guru, and he later established the worship of Radha Madan Mohan in Vrindavan. May Srila Sanatana Goswami in his Nitya Svarupa as Lavanga Manjari mercifully bless us with the dust of her lotusfeet so we can also understand this Sanatana Siksa. Srila Prabhupada has also given a summary of this in his “Teachings of Lord Caitanya”. The books of Sanatana Goswami are many ,and by carefully studying and accepting the teachings he has left without mundane interpretation,we will advance nicely in our eternal relationship of service to Lord Caitanya and Radha Krsna.